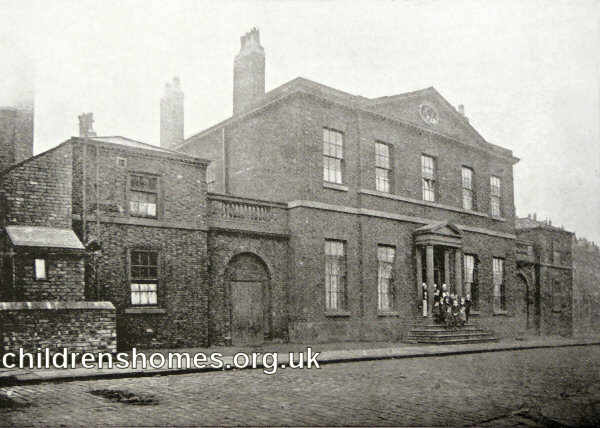 St Vincent's Home for Destitute Roman Catholic Boys was opened in 1880 and occupied premises at 4 Willow Grove Road, now part of the Leeds University site. The establishment was often referred to as "Father Downes'", its founder and director, the Rev. Father James Francis Downes. The Home could accommodate about 25 boys In 1881, the matron was Miss Mary Gaunt assisted by her sister Annie (Hannah). In 1889, following a suggestion from Mary Gaunt, the Bishop of Leeds established a new religious order with the special object of superintending homes for the destitute. Sister Mary Joseph, as she became known, became The new order was known as the Oblate Sisters of the Precious Blood, with Sister Mary Joseph, as she became known, being one of its inaugural members. By 1891, the Home had moved to larger premises known as Elmwood House, off Claypit Lane, in the Little London district of Leeds. Although it continued to occupy the same location, its address at various times was given as various permutations of Upper Elmwood Street, Howarth Street, and 15 Morphet Grove. Mary Gaunt was still superintendent of the institution in 1891, again assisted by Hannah. The Claypit Lane site is shown on the 1908 map below. St Vincent's Home for Roman Catholic Boys site, Leeds, c.1908. St Vincent's Home for Roman Catholic Boys from the south-east, Leeds. On December 6th, 1908, the establishment was certified as an Auxiliary Home, allowing it to accommodate up to 45 Roman Catholic boys who were on on licence from Industrial Schools and making the transition to independent working life. Many of the boys at St Vincent's came from the Industrial School at Shibden, near Halifax, later known as the Good Shepherd School. In 1891 it was reported that some of the older boys generated an income for the Home by working in the morning at gentlemen's houses in the area, where they cleaned boots and knives and generally made themselves useful. For this they were paid between 2s. 6d. and 3s. 6d. per week. In the afternoons they attended St Ann's School on Cookridge Street and on Saturdays worked as errand boys. In 1901, Mary Gaunt, now bearing the title of Sister Superior, was again superintendent and still assisted by Hannah. In 1911, Hannah Gaunt had become matron, with six assistant matrons and a boys' superintendent, Nathaniel Gaunt, a widow with two children who were also living at the Home. There were now 63 inmates, ranging in age from 5 to 24 years. The Home's address at this date was given in the census of the Morphet Grove and 25 Upper Elmwood Street, indicating it had expanded into an adjacent property. In 1901, a 'cottage home' for the boys who were still of school age was opened a short distance away at 8 Carr Road. On 21st May, 1903, the cottage home was accredited as a Certified School, allowing it to receive up to 15 boys placed by the workhouse authorities. By 1920, the main Home was providing accommodation for 75 boys. It was now under the superintendence of Sister Veronica Gaunt who was still in post in 1935. By the late 1920s, St Vincent's object was stated as being 'to provide a real home for destitute Catholic boys.' As well as working boys, there a number of school children were also accommodated, some paid for, some not. Boys often remained in the home until they were married. When first received, a boy was regarded as belonging to the 'shelter' class; if he chose to remain, he became a 'home boy'. At the end of 1940, the residents of St Vincent's were evacuated to the village of Boston Spa, the older boys being housed in part of the St John's Home, and the younger ones in a newly acquired property nearby named St Mary's. In 1946, the older boys were transferred from St John's to the Society's St Gabriel's Home at Horsforth. After the Second World War, the Claypit Lane premises became a Polish Catholic Centre. The building no longer survives. Leeds Roman Catholic Diocesan Archives, Hinsley Hall, 62 Headingley Lane, Leeds LS6 2BX. Has Annual Reports (1891-2, 1895-8); Diocesan Rescue and Protection Society Annual Reports (1912 onwards).